Caminito del Rey, Alora, Malaga. 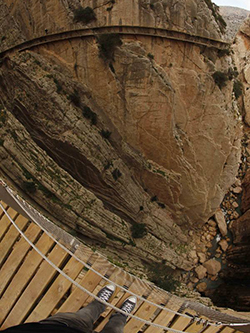 Perched 100 metres above the Desfiladero del los Gaitanes gorge, the Caminito de Rey walkway is a three kilometre long one metre wide path clinging to a sheer cliff face and once considered one of the scariest and most dangerous routes worldwide. This visually stunning walkway through the Gaitanes gorge has been recently renovated and reopened 15 years after being closed due to disrepair and multiple deaths. Now you can experience this walk, enjoy the spectacular views in safety and peer through a newly installed glass floor. Originally built over 100 years ago for workers at a-hydroelectric power plants along the Guadalhorce river, the walkway allowed for transport of materials. 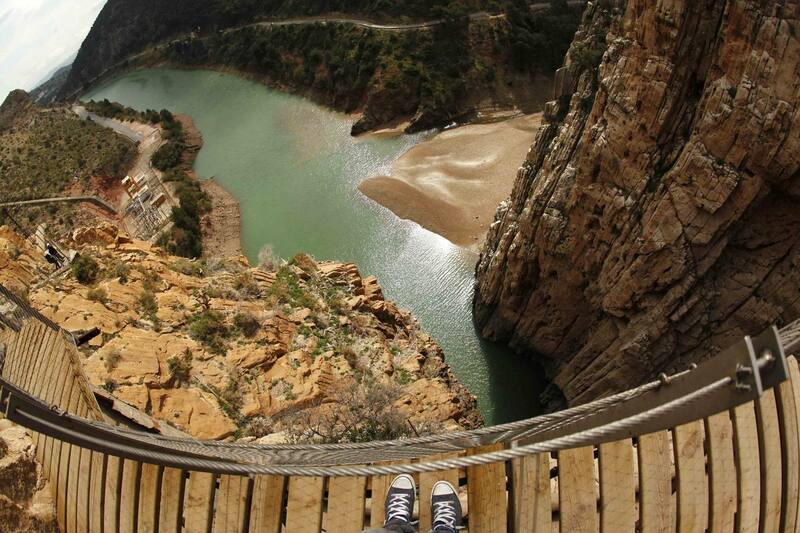 It gained its name "walkway of the king" (Caminito del Rey) when King Alfonso XIII walked along its heights for the opening of the dam in 1921, twenty years after construction of the walkway began. Disrepair and multiple deaths forced the closure of this historic pathway in the late 1990s and the walkway became the domain of adventure seekers determined to enjoy the views, challenge and adrenaline rush. This led to a large 2.3 million euro investment by the local government and a commitment to repairing and reopening the walkway. After its reopening early 2015, it has been labelled as one of the new hottest travel experiences by lonely planet. The Gaitanes gorge was forged by the Guadalhorce river and is one of the most beautiful places in the Province of Malaga. Consisting of limestone and dolomite, the gorge is 3 kilometres long with vertical walls up to 300 metres in height and only 10 metres wide at places. 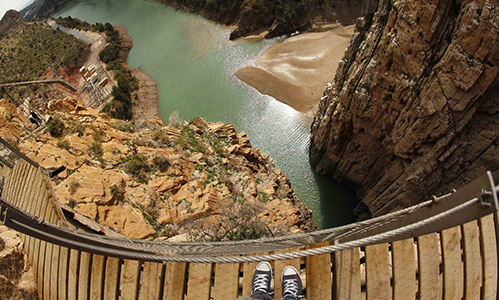 The views on the Caminito del Rey won´t disappoint, and combined with the dizzying height of the walkway, will take your breath away. A definite must-do. The pathway is open Tuesday to Sunday throughout the year and tickets can be booked at https://reservas.caminitodelrey.info/ It is important to reserve tickets online as you need the permit to be able to go on the walkway. If you stay at a local hotel, you may be able to get permits via the hotel as well. You can chose to start from either the Ardales or Alora side. It is important to be at the checkpoint 30 minutes before you allotted time and make sure to bring the passport or ID that was used when booking your permit/ticket. Estimated walking time is 4.5-5 hours. 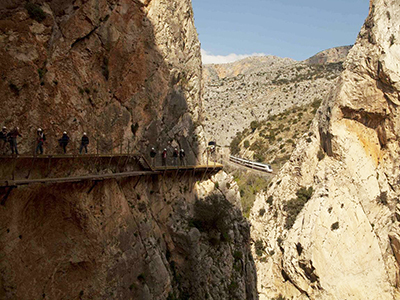 Shuttle Buses are available from each end of the Caminito del Rey and run every half hour between 12:30pm and 20:30pm. The shuttle bus costs less than 2 Euros. The gates open from 10 am to 2 pm during winter and from 10 am to 5 pm during summer. Cost: Free for the first six months.